Villa Micika is open all year round. Reserve your room and place under the sun on-line today. Book your vacation / holiday today online from the comfort of your home/office. The greatest vacation begins with a single click. All guests are provided FREE INTERNET and if you have your own laptop or pocket PC , we have FREE WI-FI (WIRELESS) access to the internet. IN WINTER TIME - FREE PICK UP SERVICE FROM THE MAIN BUS STATION OR FERRY PORT TO OUR HOSTEL. Vila Micika is the perfect location for your visit to Dubrovnik and our villa is the ideal choice for the tourist and modern backpacker. The guest house is also available for groups families , students excursion and wedding . An email will be sent to you from Head Office within 12 hours to confirm your booking. You will also receive from the hostel e-mail with all the instructions too. So please check your mails before arriving . If you want we will send direction by SMS if you have your mobile phone with you. For guests coming from the US or Asia, please make sure you that your mobile is working on the European network (GSM). please feel free to add your comments on Hostel Reviews. 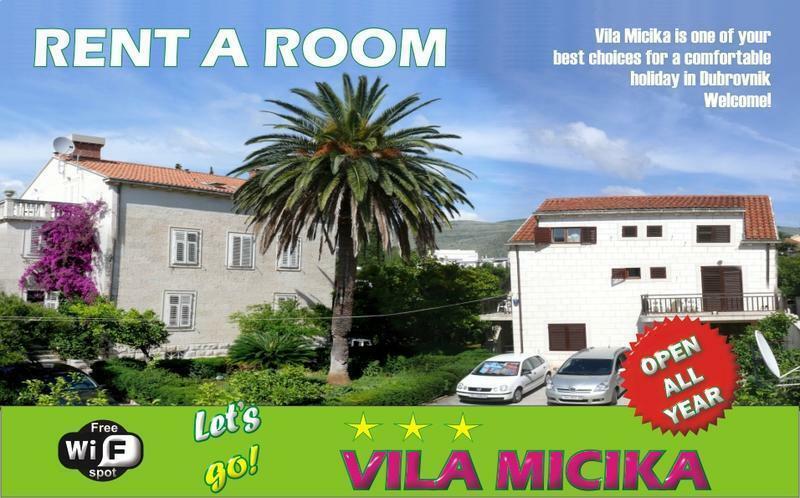 Villa Micika is open year-round, with first class rooms all with TV/SAT, ventilator, refrigerator , shower-bath and toilet. The guests can use a big terrace with chairs, table and barbecue, a good chance for happy hour and dinner party. Although we do not have a kitchen, guests can use a refrigerator , microwave and water-cooker. There are many cafes, bars and restaurants close to the hostel. All our private rooms have Air Condition - Extra charge 10 EUR per day . 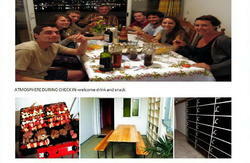 We offer hostel dorm beds as well as private rooms at the lowest prices of the Dubrovnik hostels. We have 1 shared mixed rooms, 3-bed female dorm , 3-bed male dorm , and five 2-bed private rooms all with TV/SAT, fridge all with private shower-bath. The price includes all utility costs (water/electricity), bed linen, towels, personal locker and final clean-up. It also includes a tourist tax and VAT. If you are not convinced yet, check out our profile our profile on the famous social network www.facebook.com Our name is Hostel Villa Micika - Dubrovnik. Just add us and check our foto section and other info you need. **WE SUGGEST THAT YOU PRINT YOUR BOOKING CONFIRMATION. If you are coming to Dubrovnik for a conference we are only a 10 minute walk to the Hotel Dubrovnik Palace and Hotel President Dubrovnik convention center and we are a five minute drive to the Hotel Hilton Imperial, Grand Villa Argentina and Excelsior convention Center. If you have your own laptop , we have free wireless access to the internet. *FREE Bed Linen and Towels. *Join our fan page 'Hostel Villa Micika - Dubrovnik ' on facebook! ***Airport pickup can be arranged if requested, from airports to Villa Micika . There is a 25 Eur Regular Charge for Pickup Service. If you want us to pick you up from the airport, please let us know in advance the flight number and arrive time by email or SMS . Free luggage storage is available for those arriving earlier. Visit Ston and Vila Koruna and enjoy in oyster delicacies that are cultivated in Bay of Mali Ston. 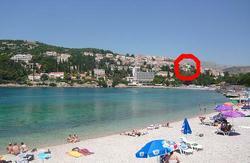 VILA KORUNA is located at Mali Ston on the peninsula of Peljeac, along the sea, only 50 km away from Dubrovnik. It has 6 luxurious rooms and fully furnished apartments (TV-SAT, phone, air-conditioning) together with a restaurant, banquet hall and summer terrace. Whether the reason for your visit to Mali Ston is business or pleasure, contact the professional staff of Vila Koruna that will make your stay as pleasant as possible. A hotel swimming pool, fitness center, terrace with live music for dancing and Internet club just 100m away. Tennis Center, beach volleyball, water sports, boat rental, all day, half day and sleep over excursions, fish picnics, specialized tourist boats leave from the main beach on a daily basis and all that just 300m away. During your stay in in Dubrovnik we recommend that you pay a visit to Dubrovnik City Walls, the island of Lokrum, Trsteno and the Arboretum, Ston and the Ston Walls, City of Korcula as well as National Park of Mljet- on the island of Mljet. So if you are looking to have a great time in Dubrovnik and meet new people in a fun and friendly environment then come and stay with us. We look forward to seeing you. Vila Micika staff wish you an unforgettable holiday in Dubrovnik! Thank you for visiting our page and have a safe trip to Dubrovnik! Buses follow the flight plan of Croatia Airlines and run from the Ä†ilipi airport to Pile (Old Town gate) where you can continue by taxi or bus line No. 6. At the entrance to Dubrovnik just follow the directions to Lapad bay where you will find signposts to hotels (Grand hotel Park, Hotel Sumratin and hotel Zagreb). From the bus station to Pile you get by buses No. 1A, 1B, . Once in Pile (Old Town gate) you can take a taxi or bus No. 6. and get off On Lapad post office station . To come back from Old Town take bus number 6 and the stop called Posta (pronounced Poshta). Dont worry if you miss it the bus stops around the corner and up a small hill get off here and walk back.